Due to a strange obsession with the War of the Worlds and the famous Orson Wells broadcast in particular, my Halloweens have always been a bit Martian-centric. This year was no different. 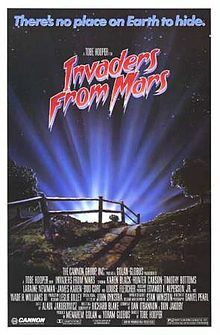 My love of Martian invasions extends to both versions of Invaders from Mars, the 1986 version even a little more than most since it’s really the film I saw first before 1953’s War of the Worlds and Invaders from Mars. It was also shortly before the War of the Worlds TV series that I was extremely addicted to as a young Martian-in-training. Plot-wise both films are nearly identical. David McLean/David Gardner (Jimmy Hunt and Hunter Carson respectively) wake up to discover a large UFO landing just over the hill. Slowly everyone who visits that spot comes back acting strangely, including parents, cops, and even soldiers. Before long, David is on the run, trying desperately to avoid getting captured while looking to find anyone who will believe him. The Martians have landed and they are slowly and surely taking over the town. Their target is a rocket that will soon make its way to Mars. The 1953 version comes across as very stark and strange. From the opening moment there is a dream-like haze over everything. The world feels like a typical 1950’s small town turned nightmare. David’s dad is a sweaty automaton who coldly smacks his son to the ground. The descent into the Martians' underground becomes a thing of pure madness complete with a cackling Martian leader. The Martians aren’t really that far removed from humans in appearance, which definitely brings a creepy edge to everything they do. The 1986 version fits in well with the kids adventure films of that era like, Goonies (1985), Explorers (1985), or The Gate (1987). The world feels much homier, and at the same time the invasion is a lot less sinister and a little more darkly humorous. David’s mom makes a pile of burned bacon for breakfast, David’s teacher chows down on a live frog. The Martians are not only here for our rocket, but also our copper and they aren’t above stealing a child’s penny collection to do it. 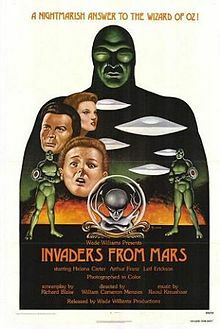 The Martians are bigger, more cartoonish and much less human which takes away some of their eeriness but gives the movie a fun “monster film” vibe. Both films play everything out from David’s point of view. Adults are for the most part, scary and untrustworthy. The Army is idolized and everyone involved is a stand-up guy with a lot of cool guns and bazookas. Everyone defers to the Davids to make decisions and the 1986 version even has him play a crucial part in the escape from the rapidly fleeing Martians. Much has been made about the final moments of the original and the 1986 version by proxy since it’s pretty much the same. In this case the strange dream-like nature of the original makes the final scene fit in well with what has gone before, as opposed to the more naturalistic take in the remake. The final moment of the ’86 version is taken to an even further extreme as David watches in horror at what’s become of his parents. It’s the kind of touch that feels a little out of place in the film, but right at home in Tobe Hooper’s other work, it even feels just a little bit like the closing moment from The Texas Chainsaw Massacre 2 (1986). Check them out. Quite a bit has been written about the 1953 version and I think the 1986 gets overlooked more than is deserved. They both make a fine addition to any Martian invasion movie night.